In spite of being marred by transgression, nature still bears an eloquent testimony to the love and power of a Divine Creator. After resting under the heavy curses of sin for almost 6,000 years, the incredible beauty of God's handiwork continues to amaze and enthrall. When we thank God for our blessings, we should never forget to mention these incomparable natural wonders that add so much meaning to every moment of our lives. What would this planet be like without its restful carpet of living green grass and foliage? God did not have to clothe the ugly, bare soil with such a covering. Functionally, there needed to be no bright colors. Human beings could have survived on a bleak planet of gray ground and colorless plants. But they could not have survived as happily. The Creator Himself was not only a lover of beauty; He loved His creatures so much that He wanted them to be happy, too. That's why He draped the earth with a half-million varieties of contrasting blossoms and leaves. And hidden inside each tiny bud, God placed secrets that would challenge the genius of earth's greatest scientists. How strange it is that so many of those who wrestle with these mysteries do not recognize the Creative Power that produced them. Even though many naturalists stand in awe of the creature, few seem to recognize and honor the Creator. Breathing the marvelous blend of nitrogen and oxygen that makes it possible for them to live, evolutionists refuse to acknowledge that the precise 79 percent to 21 percent mixture of gases was provided by something other than blind chance. Looking through eyes so delicately arranged that no combination of scientific genius can even understand, much less duplicate, their operation, unbelievers deny the miracle which makes it possible for them to see. Through ears, which connect to a brain more complex than the largest computer on earth, doubters listen to lectures on humanism and evolution. Who are these people who scorn the record of God's creative power? They are only a tiny fragment of finite humanity, whose very existence, breath by breath, depends upon the operation of laws over which they have no control. Rejecting the divine origin of that for which they find no empirical evidence, many scientists ascribe miraculous qualities to matter itself. They build up theoretical creeds in which they place absolute faith, even to the point of believing that blind, unintelligent "nature" created life out of non-life. Is Chance Precise and Predictable? What kind of faith is required to believe that all the orderly processes of nature were produced by chance? Almost every plant and animal exhibits amazing adaptations that can only be described as miraculous. If these highly complex functions had no intelligent Creator or Designer, then our reasoning powers are staggered by the millions of "coincidences" that operate with infinite precision to produce perfect beauty, function, and reproduction on the earth. Could they indeed be the products of accident or chance? Every law of science on the subject decrees that undirected, random nature tends toward deterioration rather than order. Surely the most persuasive evidence in favor of creationism is that of nature itself. The Bible suggests that the animals and earth should be asked about their own origin. In Job 12:7–9, we read: "But ask now the beasts, and they shall teach thee; and the fowls of the air, and they shall tell thee: and the fishes of the sea shall declare unto thee. Who knoweth not in all these that the hand of the Lord hath wrought this?" Job says if you want to know how God operated in the work of creation, ask these various forms of life, ask the earth, and the earth will explain how mightily God has wrought in these things. So that's exactly what we're going to do right now. What does the earth have to say to us concerning the great power of God? Did you know there are miracles in every square inch of this earth? From the towering mountains to the vast, restless ocean and throughout the limitless universe of God, there is the throb and hum of life. From the microscopic to the immense, we can discover the fingerprints of the mighty Creator who brought all things into existence. When I look at the universe and see the amazing fact that it is in perfect balance, that life in this world has been perfectly adapted to the conditions we find here, I know that some great intelligent power is behind it, making it operate in such an accurate manner. The Genesis account of the Bible has been completely vindicated by all the findings of true science. The writings of Moses have been found to be scientifically as well as historically accurate. In this booklet, we're going to look at the water and land in particular. 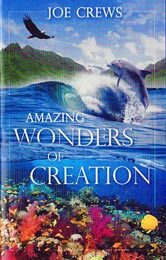 By studying the mysteries of land and sea, we will see how wonderfully they support the biblical story of Creation. Let's go back to Genesis and take a look at the story as God gave it to Moses. Genesis 1:6-8 says, "And God said, Let there be a firmament in the midst of the waters, and let it divide the waters from the waters. And God made the firmament, and divided the waters that are under the firmament from the waters, which were above the firmament; and it was so. And God called the firmament Heaven. And the evening and the morning were the second day." Long, long ago the waters that were over the earth were actually right down here upon the surface. We know that there is a vast ocean in space, suspended in the atmosphere. We’ll find out just what purpose it serves in a moment, but at one time that water was resting right here upon the earth. God divided it and lifted a part of it up into the heavens while part of it remained here. Now look at verses 9 and 10. "And God said, Let the water under the heaven be gathered together unto one place, and let the dry land appear: and it was so. And God called the dry land Earth; and the gathering together of the waters called He Seas: and God saw that it was good." How did Moses know there would be several oceans or seas? He had absolutely no human way of knowing there could be more than one body of water in the entire world. He never went around to see how many oceans were in the world, but God inspired this truth in Moses' mind. He said there were seas or oceans. Here's another good question to ask. How did Moses know that all these various bodies of water would be connected and would rest in only one bed? Now, isn't that what he said? “Let all the waters be gathered into one place and let the dry land appear." In the next verse, he says there were seas or oceans. It is a scientific, geographical fact that all the oceans of the world are joined together, and they do all rest in a common bed. Moses could not have known that of himself. He didn't say this of dry land. No, it was divided up into continents. Part of it would be over here and another big, discrete mass of it would be in another location. But concerning the waters, he said it would all be in one place, and yet it would be divided into oceans. I think it's tremendous that the Bible is so scientifically accurate as to reveal these things. Now let's see how intelligence and design came into the ratio of land and water. One-quarter of the earth's surface is dry land, and three-quarters is covered with water. In the United States alone we have three and three-quarter million square miles of dry land, and all of it has to be watered and cared for. In fact, if it weren't watered, there would be no vegetation and no growing grass or trees. Just imagine for a moment that the ratio of land and water was changed from what it is at present. The proportion of water and land determines the rainfall on the earth. Suppose the ocean was only half its present size. That would mean our rainfall would only be one-quarter of what we now receive. What would that mean for the three and three-quarter million square miles of land we have in these United States? All of it would be turned into a vast, dry desert! But on the other hand, if half the present land were added to the ocean, there would be four times as much rainfall as there is now, and the entire United States would be turned into a vast marshland where human life would be almost impossible. Now suppose that mankind had to water this entire three and three-quarter million square miles of land. How could we ever spread out that water and irrigate the land effectively? What a tremendous task that would be! "There's plenty of water in the ocean," someone might observe, "we could simply use it to water the dry land." Although it may sound reasonable, there are three problems connected with it. First, transportation. We'd have to get the water out of the ocean and spread it evenly over the land. The second problem is the salt it contains, which would kill all the green plants. The third problem is weight. Water is 800 times the weight of the atmosphere, presenting the challenge of how to transport and disperse it. How has God solved the weight problem? First, He uses heat. We know heat expands things and cold contracts them, and that water is the material most subject to expansion. In fact, when turned into steam, it becomes 1,600 to 1,700 times its original volume. Remember, though, this water is 800 times heavier than the atmosphere. But God simply sends down the warming rays of the sun, turning the water into a vapor that is 900 times lighter than water. Now it is one-eighth times lighter than the atmosphere. So this vapor is easily lifted up out of the ocean, carried into the sky—perhaps miles into the air—and formed into great cloud masses. The second problem is deadly salt, but God simply evaporates the water and leaves all the mineral deposits and impurities behind. Taken up into the clouds, the water is sweet and soft, perfectly adapted to irrigate the earth. What about the third problem—transportation? The water that is lifted up is still hanging over the ocean, which doesn't need any more water. God sends along winds to blow the clouds and spread them out over the dry land area where it is needed. But how to get all the water down out of the clouds? Here is another wonderful miracle. Cold will contract, of course, so when the clouds pass over the mountain peaks, the cold air reaches up and begins to cool those clouds, turning the vapor into a condensation of moisture. Now consider what would happen if the clouds gave up all the water they contain at one time—it would flood the entire surface of the earth with three feet of water! Therefore, the cooling process must be gradual. For example, if the temperature of the cloud is lowered by 9 degrees, it will drop half its water! So God arranges for a gradual cooling process to let the rain come down in gentle to vigorous showers to provide the amounts needed to revive the earth. What an incredible process! Of course, some of it rains back into the ocean, but it is needed there to provide the necessary amount of oxygen for fish living in salty ocean beds. Did you know that these great facts of nature were all known and understood long before the scientists and naturalists discovered them? Ecclesiastes 1:7 is a most interesting verse. "All the rivers run into the sea; yet the sea is not full." Why not? The text continues to give the answer. "Unto the place from whence the river comes, thither they return again." The Bible says the reason the seas do not overflow is that the water is taken up again and returned to where the rivers come from. And so there is a constant movement of water going up from the ocean in vapor form, carried as clouds over the land, and brought down again as rain, which forms rivulets that find their way back to the sea. Even though the great naturalists felt they had made a new discovery when they found out about the cycles of clouds, they could have known it all by reading the Scriptures. Another text with scientific information is Job 26:8. "He bindeth up the waters in his thick clouds; and the cloud is not rent under them." This is a beautiful text, explaining that the clouds don't break and spill all their water at once, even though millions of tons of water are drawn up from the oceans into the clouds. And, of course, Job was correct. We've just found that God has a process of gradual cooling that releases the water little by little as it is needed to irrigate the surface of the earth. God revealed it to Job long before mankind figured it out. I'm sure all of us know that water has weight, and that its pressure increases dramatically as the depth increases. Certain fish that exist in the very bottom of the ocean are especially engineered by God to withstand this tremendous pressure. If brought quickly up to the surface, they practically explode. The pressure that God put into their muscular structure is still there on the inside when they are brought up where the pressure is not exerted from the outside. This is a wonderful fact, but do you realize that we, too, live in the bottom of an atmospheric sea, which also has tremendous weight? At sea level we are living down at the bottom of a very heavy, dense covering. As the ocean is to the fish, so the atmosphere is to us. Every moment we live, a pressure of 14 pounds per square inch is exerted upon our body structure, and that's pretty heavy. We think a man is strong if he can carry 200 pounds on his back. In fact, the strongest man that ever lived put only 415 pounds over his head. Yet, every single form of life in this world, whether it's a 90-pound woman or a burly man, has a constant pressure of over 15 tons at sea level pushing and pressing upon them from every direction. That's 30,000 pounds! Even the filmy, gauzy insects have been designed by God to withstand their proportion of this pressure. That little gnat, so light and frail that it seems anything could crush it, is built by God to withstand the weight of the atmosphere. Can you think this happened by mere chance? Consider Job 28:25. "To make the weight for the winds; and he weigheth the waters by measure." The Bible says the wind has weight. The air, in other words, is heavy. The atmosphere has weight. If you climb a mountain, the higher you climb, the thinner the atmosphere becomes, and you feel distressed and uncomfortable. Why? Because the pressure is not as great. You see, God has built in a certain amount of pressure that balances that on the outside at sea level. If you went high enough, you would be just as stressed as the fish brought up from the ocean depths. How wonderful that God has designed each living creature to be perfectly comfortable in its own environment. Now consider another, even greater, miracle. The atmosphere around us is made up of two main ingredients—nitrogen and oxygen—whose mixture is always the same, whether at the highest mountaintops or in the deepest caves. The perfect balance is 79 percent nitrogen and 21 percent oxygen. You might ask, "Why is it this way?" Is there some particular reason for it? Is it important that we have this exact mixture of nitrogen and oxygen?" Yes, I can assure you it is most important. If the nitrogen were increased, our life processes would slow down and we would die. If the oxygen were measurably increased, our life processes would be rapidly increased. Our pulse rate would just run away and soon we would wear out and die. But God made it just right. Suppose, for example, it was two-thirds nitrogen and one-third oxygen. If that proportion prevailed, and an electrical reaction caused the elements to combine, do you realize that the whole world would be turned into laughing maniacs? Everybody would be laughing because that would produce the laughing gas, N2O, the same kind dentists sometimes use when extracting teeth. Or suppose it was divided half and half. That would produce nitric oxide, which is quickly fatal to all forms of life. Was it just a lucky accident that it came out like this? Did some blind happenstance of nature produce this exact mixture that is necessary for life support? Or was there an intelligent design? This world would become chaotic if this atmospheric mixture slipped out of control for just a single instant. We would see one of the most tremendous of all explosions, because nitrogen is the basic component of gunpowder; and oxygen, of course, makes for rapid combustion. It would be "Goodbye, world!" And yet some day, apparently, there is going to an explosion like this. Some day the elements are going to melt with fervent heat, the Bible says. Peter tells us in 2 Peter 3:10 that "the heavens shall pass away with a great noise, and the elements shall melt with fervent heat." I don't know how God will arrange that, but I do know that some great fire one of these days is going to burn, and the earth will be purified by this strange fire of God. And the elements will be involved in it because the elements are going to melt. Maybe God is going to change just very, very slightly the present proportion of nitrogen and oxygen, causing this great conflagration to take place. I do know this—we must be ready for that day when it comes. The Bible indicates it is near at hand. Another of the mysteries of nature was described in the Bible long before it was investigated by science. We read about it in Job 38:8–11. "Or who shut up the sea with doors, when it brake forth, as if it had issued out of the womb? When I made the cloud the garment thereof, and thick darkness a swaddling band for it, And brake up for it my decreed place, and set bars and doors, And said, Hitherto shalt thou come, but no further: and here shall thy proud waves be stayed?" What beautiful, poetic language we find here to describe the creation of the ocean. It speaks of it as being born and coming forth from the womb. God says that the cloud was the garment of it and a thick darkness was a swaddling band placed around the ocean at its birth. But then God added, "Here ye may come but no further; here shall thy proud waves be stayed." The scientists of this world have been amazed in learning the secrets of the tidal actions. They still don't understand all the deep, underwater cataclysmic actions that affect the tides and wave patterns. No naturalist on the face of the earth has figured out all the secrets of these swift tidal waves as they move to and fro in their own mysterious ways. By the way, these tides and movements of water have been in perfect balance to contribute to mankind's comfort. I think of the mighty Gulf Stream, for instance. We don't know everything about it, but we do know life in the United States would be almost impossible were it not for the fantastic influence of this great stream. It comes out of the Gulf of Mexico, goes along the eastern seaboard, and up into the northern sections of the world. It is like a river, flowing through the midst of the sea, and can be seen distinctly from high above because of its different color. In fact, this river is about 70 miles wide and nearly 3,000 feet deep. When it leaves the Gulf of Mexico, the water temperature is 84°F., and off the coast of the Carolinas it is still a warm 80°F. This warming influence actually makes the northern coastal regions of America and Europe inhabitable; otherwise, they would be frozen wastelands. Now notice what happens as this warm river reaches the entrance of the Arctic region at Baffin Bay, where it meets a frigid polar stream that is rushing southward. As a result of the titanic collision of these two giants, the polar stream is forced to dive down thousands of feet, where it continues its southward course, coming up finally in the West Indies during their hottest season, thus cooling down the terrible tropical heat. The Gulf Stream gets deflected eastward, going up along the British Isles, making these habitable. It was in God's plan for this to happen. I don't believe for a moment that all this happened by chance or accident. Without that deflection of the Gulf Stream, some of those northern lands would be locked in eternal winter. Surely God was behind the entire plan. Let's hurry along now and take a quick look at the creatures of nature and see how intelligence and design came into the picture. Think for a moment of the fish that inhabit the oceans. They are constantly subject to attack from their enemies from above—like the gulls that swoop down to make their meals off marine life. Do you know that fish have specially constructed eyeballs enabling them to look almost instantly in any and all directions? They see behind, below, above and on the sides; furthermore, their eyes are designed to take into account the refraction of light. Yes, fish can see 30 percent farther than other visual instruments because God designed the eyeball of the fish to take into consideration the refraction of light. We tend to think it's a wonderful accomplishment when the oculist manufactures special goggles for divers that compensate for refraction in the water, yet God did it for fish long before. Goggles could never have come into existence by chance, yet evolutionists contend that a fish's specialized eyeballs just happened. In the waters of Malaya lives a fish with bifocal lenses built right in its eyes. This little sardine-sized fish is prized for food by the seagulls especially. They are constantly swooping down to gobble up this little fish if they can. So the little fish has to watch carefully for this approaching danger. It must have good far vision, but since it feeds on the microscopic larvae that abound in the water, it must have very good near vision as well. And do you know the Creator provided a little membrane that comes halfway up on its eyes, giving it bifocal vision? That little fish can look up and see the gulls coming or look down and see those nearby bits of life that it can feed on! We think it wonderful that the skilled optometrist and oculist can perfect glasses permitting us to see near and far away, yet here is a fish that has been around for thousands of years—and God made it that way from the beginning. It did not just develop blindly; it had to be created. Intelligent design was behind it. Now let's examine two Pacific coast water birds. I can find no stronger evidence of design in nature than with the Ousel, a very friendly little bird that lives near mountain streams. It can usually be found where the water is swift-flowing and splashy. This buoyant bird will be floating along, apparently weightless, and then suddenly sink to the bottom like a piece of lead. There he walks around picking up bits of food on the streambed. After taking his fill, he goes over to the bank, shakes himself, and mysteriously sets himself afloat again like a wisp of smoke. It has been discovered that this strange bird has some special equipment—a muscular apparatus that can instantly exhaust every bit of air from its body, letting it sink down; then when it walks out, it can take in air again and float off once more. Now, that's special creation, isn't it? The evolutionists would say, "Well, it needed to have this bit of apparatus, so nature provided it." Of course, they don't say what nature is, but maintain that it just grew by some accidental development. The truth is that God provided it. He made this particular bird as He did because He saw that it needed this for survival. Another kind of bird found on the Pacific coast lives on a diet of large worms that live in holes in the sand. Because this worm is down at the very bottom of its hole, the bird must go down to get the worm out. It so happens that, although its beak is exactly the right length to reach into the hole, the narrow hole keeps the beak squeezed shut. What a predicament—to be able to see and reach a luscious worm but not be able to open his beak to pick it up! Do you know what God arranged for this particular bird? He created a tiny flap much like a surgeon's forceps at the bottom of the beak. With this special organ the bird can pick up the worm, back out of the hole, and gobble it down! Isn't it wonderful that God thought of a little bird and made something special so it could get its food conveniently? If He so loves the little birds and provides the things to make their existence comfortable, don't you think He's willing to provide everything that we might need? He loves us even more. Remember, He knows when the sparrows fall. Some years ago, a scientific magazine published an article by a clever biologist who did not believe in evolution. In Evolution Goes to Pieces on a Bee's Knee, the author first reviewed the evolutionist's teaching that when the need for a certain organ develops in any creature, the organ is produced in response to that need. Nature itself, or some blind chance, supposedly comes along and produces the necessary organ to fit the creature for survival. Then he cited the example of the bees. When bees crawl into pollen-filled blossoms, their breathing apparatus gets all stopped up with pollen. In fact, they can't even breathe while they are inside gathering their pollen. Now it so happens that every bee has a special brush located on its knees—a stiff brush—that it uses to clean out its breathing apparatus when it comes out of the flower so it doesn't suffocate. This biologist noted that if it were true that these insects develop special equipment in response to a need, the very first bee to exist did not have those brushes on its knees. When it went into the flower, it would have suffocated; consequently, the whole bee family would have become extinct right then and there. No, rather than these brushes developing slowly through the ages in response to a need, they were provided by God to meet the need and save the very first bee that was made. The conclusion is that God anticipated the needs of His creatures and made them with every necessary apparatus. How thankful we ought to be that God can supply all our needs in advance. The Bible says the fool hath said in his heart, "There is no God." Only a God of love and power could have made the marvels we see about us. And if He cares for the tiny animal world, He cares for us, too. He loves us even more than He loves that little bird out on the West Coast, and He wants to save us. He wants to take us at last to a place where nature will be in perfect balance again and where all of the curse of sin will be forever removed. Can we doubt the love of God, who makes such infinite provision for everything He created? Nothing has been left alone to suffer extinction or deprivation. Only man's bungling interference with the delicate balance of nature has brought sorrow and tragedy. If God cares for the needs of the tiniest cell of the smallest plant or animal, don't you think He loves us enough to care for us? One of the most thrilling facts I learned about the miracles of nature concerned the lowly cocklebur. Surely it is one of the most despised of all plants due to its clinging, pricking nature. Yet consider the marvel of its reproduction. Every pod of the cocklebur has two seeds inside to guarantee its survival. But during the first year only one of the seeds will begin to grow. The other seed waits till the second year to start growing in order to perpetuate two seasons of growth. But if something happens to the first seed so that it does not grow and produce, the second seed begins to grow immediately instead of waiting for the next year. What built-in wisdom of God communicates to that waiting seed that it should begin to grow when the first seed is destroyed? No evolutionist has been able to harmonize miracles like this with their theories of naturalism and chance. Surely we can see that God's care extends to the meanest and lowest order of growing things. Are we not more precious to Him than the cockleburs? If He works miracles to safeguard a clinging, contrary cocklebur, will He not guide the ways of those for whom He gave His life? May God open our eyes to the wonder and wisdom of His great work of creation. Tonight when you kneel to pray, remember to thank God for the landscape of beauty that always lies beyond the manmade mess of human obstruction.